Imagine a real life Mario taking to the streets for a bit of real life Mario Kart (or in this case Remi Kart), throwing banana skins beneath the wheels of your car, while all you can do is watch in amazement and bewilderment from the confines of your car behind? 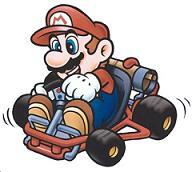 Well imagine no further and click after the jump to see a real life Mario taking to the streets in his go-kart. The makers of this great Youtube footage went all out, right down to the sound effects. You may find the idea funny, but would you really find it funny if the banana skins were being thrown at your car, or would road rage, finger gestures and expletives ensue? I must warn you, if your intentions for watching are a bit more malevolent than simply having a laugh, you might be disappointed to know, the other cars don’t spin out and crash, causing carnage.